I started making it on Jan. 12th of this year so it took me just under six months to do and I wasn't working on it every day. I would work a little at a time since I have cervical spondylosis and crocheting makes the pain worse if I do it for a long time. I was thinking that this may be the last crochet item I do because of the CS but I figure if I just crochet a little at a time I can keep on doing it. My avatar is the beginning of this blanket. I used a size 6mm hook. It is quite heavy so will be used during the winter here. I finally got my Bavarian crochet afghan done for our queen size bed. 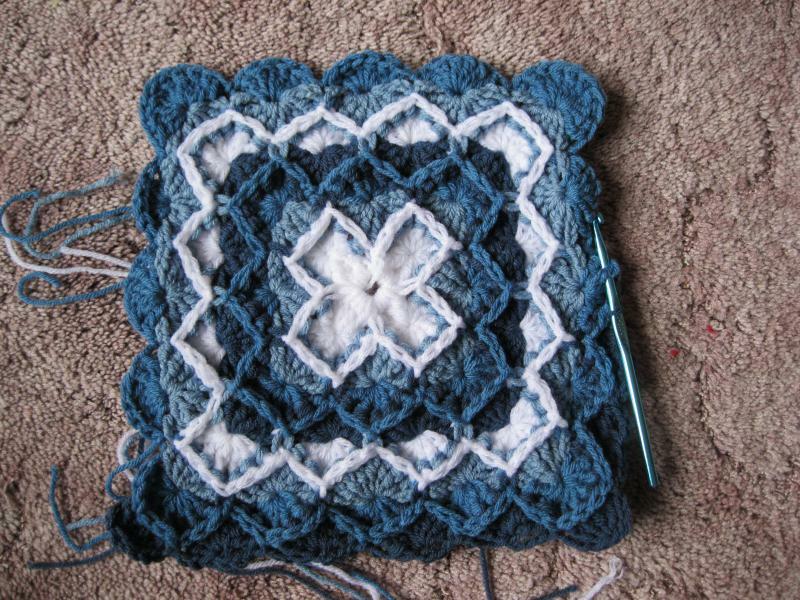 I used shades of blue with white so I could use up some of my stash of yarn. So when I ran out of one colour I added in another so that is why it looks the way it does. I am quite happy with how it turned out and it will keep dh and I nice and warm this winter. Very cute. I really like these and love the plug on the end. That is so cool. You did a great job and she is so cute. Well I finally got the faces done on my giant dolls. I think they turned out quite nice. They are standing by the front door but I am thinking I might put them inside my front porch to greet people. Puffins are my son's favourite bird and that is so cute. I found these child mannequins at the local thrift store. They are poseable and thought they would make great dolls. So brought them home and made them heads and hair and just have to finish up their faces but wanted to show them off. Hope you like them. Very Cute. I love cats and dolls so I will definitly making this. Since I can't crochet right now my creativity needed an outlet and when I found this Woman pattern on the internet I just knew I had to make it. She's 36" long and I found the doll wig at the local thrift store this summer and it works perfect on her. I drew her face myself and there are pipe cleaners in her fingers so they can bend and she can hold things. Very nice. I was going to try this myself til I found and ergonomic Aluminum Crochet Handle made by Boye this summer. It comes with the ergonomic handle and different sized washers to place over the hooks size 2.25mm-6.5mm. I can't remember the price of it, but it was less than $20.00. I picked it up when I was on Vancouver Island in July and got it in a little yarn store. That is just stunningly beautiful. I have that book and even have that pattern bookmarked. I've always wanted to make it and seeing yours has made me want to make it for sure.